Although not the oldest passage tomb in Ireland, Newgrange is without doubt Irelands best known prehistoric monument. Dated to around 3200 BC, Newgrange is 1,000 older than Stonehenge and centuries older than the great pyramids of Egypt. The earliest passage tombs in Ireland are on the west coast in County Sligo and their construction and design developed as they spread across to the east coast culminating in the great complex at the Boyne Valley. 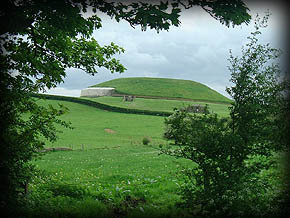 The tombs of this complex include the great monuments at Newgrange, Knowth and Dowth. The Boyne Valley complex was designated a World Heritage site in 1993 by UNESCO. 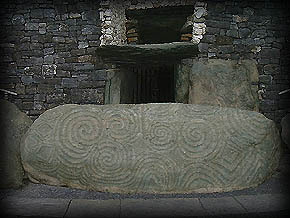 The Mound or Cairn at Newgrange is about 300 feet in diameter and has 97 Kerbstones at the base of the cairn, Kerbstone 1, pictured left, is the beautifully decorated entrance stone, the kerbstones are all numbered in sequence running clockwise from the entrance stone to kerbstone 97 on the right of kerbstone 1. The passage is 62 feet long and consists of 22 orthostats on the left and 21 orthostats on the right, opening into a cruciform chamber with 2 side chambers and 1 chamber at the rear. Some of the orthostats of the passage bear megalithic art and the orthostats and roofs of the chambers also bear some decoration. Immediately above the entrance to the passage is a small opening known as a roof-box, which is in alignment with the Sun at the winter solstice and allows the Suns rays to penetrate the tomb and light up the central chamber during this period. The chamber has a wonderful corbelled roof rising some twenty feet above ground level inside the tomb, as you enter the tomb the passage floor rises to almost the height of the roof-box when it reaches the chamber. 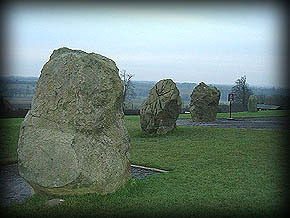 Surrounding the main mound or cairn are twelve standing stones, some of which are pictured left, that are believed to be part of a stone circle known as the Great Circle which surrounded the cairn. The three stones pictured are immediately outside the tomb's entrance and six more stones stand to the west of the tomb with three more stones located around it. There may have been between thirty five to thirty eight stones making up the original circle but excavation has proved this to be inconclusive. In the field Southeast of Newgrange lies a large unexcavated tumulus, pictured right, known as Site A. This satellite site is directly in alignment with the winter solstice sunrise and has a large embankment surrounding it, but the embankment is getting more difficult to see due to farming. Site B is another tumulus. Site C and D are standing stones. Site E is another mound with some kerb stones. Other sites named F,G,H,I,J,K and L are also mounds. Sites M, N,P,Q and R are ringforts/ enclosures. 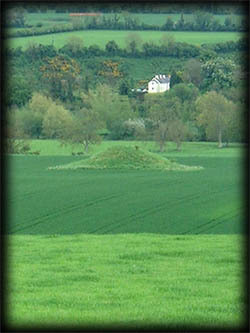 Site S is a mound and Site T is a small passage Tomb at Townleyhall, Co Louth. Site U lies about 500 metres East of Newgrange and may be a ruined passage grave. Discovery Map 43. O 0070 7272. Last visit April 2012.